Nothing says Fall like a crockpot slowly cooking your meal, simmering your meats, vegetables and herbs for an aroma that is equal parts mouth-watering and hearty. As the temperature outside drops and the days get shorter, most of us turn our focus to staying at home, rather than hitting the gym. Add these Weight Watcher’s crockpot recipes to the mix for the days when you know you’re not leaving your couch. Fall and Winter can become the seasons of hibernation for some people, and holiday parties and baking skyrocket the temptation to fill ourselves with sweets and baked goods. It’s great to indulge from time to time, but you can’t let your healthy eating totally fly out the window. These Weight Watcher’s crockpot recipes are healthy and will help you watch your weight. They’re filled with nutritious, scrumptious ingredients that will make you crave them again and again. You can pretty much slow cook anything these days, from stew to chicken teriyaki, to shrimp and vegetable curry. There’s something about slow cooked meals that make them second to none. They ooze with flavor and are cooked to perfection. Stepping into your house after a long day to the smell of a home cooked meal is nothing short of luxurious, and these 60+ crockpot recipes will keep you satisfied all season long. Don’t own a crockpot? TheBlack Decker Digital Slow Cooker comes highly recommended. 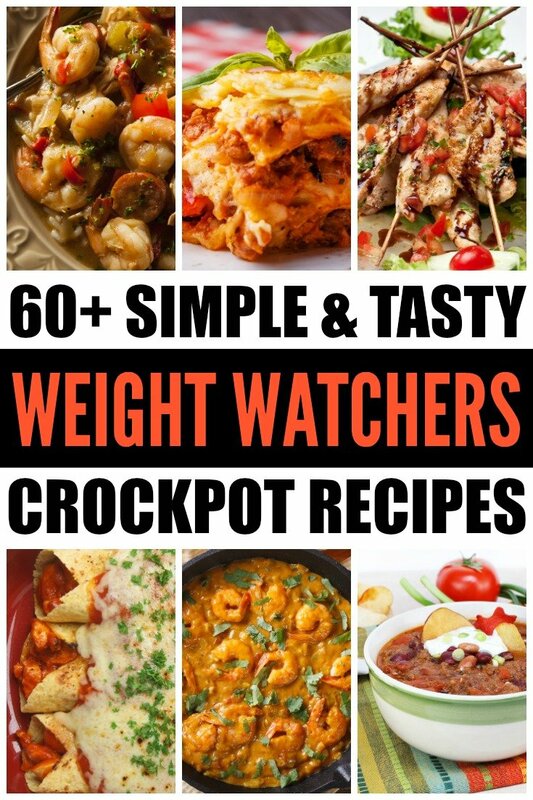 And if you’re just getting into crockpot cooking, you can also check out this book: 100 Weight Watcher’s Slow Cook Recipes. Indulge in these crockpot recipes to keep you full and healthy all through the season. Are you hungry yet? I sure am. This list of Weight Watcher’s crockpot meals will keep you full and healthy this season, while keeping your weight in check. Get cookin’! If you liked this collection of Weight Watchers Crockpot Recipes, please share it on Pinterest! And if you’re looking for more great crockpot recipes, please follow our Crockpot Meals board on Pinterest!